CSUMB's new Chief Diversity Officer Brian Corpening inside the Tanimura & Antle Family Memorial Library. CSUMB’s new Chief Diversity Officer has lived all over the country and abroad, but returning to Seaside and Cal State Monterey Bay has been like a homecoming. Brian Corpening was born on the former Fort Ord when his parents, Thomas Sr. and Vera Corpening, were stationed here with the Army in the 1950s. The family moved away when Corpening was a just a toddler, but returned for two memorable years when he and his older brother, Thomas Jr., were teens. Corpening says his family considers those years some of the best of their lives, before the tragic death of his brother changed them forever. Thomas Jr. was murdered when he was 17 while the family was living in Iran. “(Monterey Bay) for my family represents the happiest times. My brother and I were born here, and we came back when I was in the ninth grade and lived on base,” he said. Many of those happy memories revolve around the game of golf and the base’s golf courses, Bayonet and Blackhorse. Both remain popular today as public and championship courses considered among the best on the Monterey Peninsula. Corpening’s father took up golf while at Fort Ord and soon had his sons, who were baseball and football players before, playing the game as well. Not only did the brothers play golf, they were exceptionally good at it. They became the first African-American golfers to play in the qualifying tournament of the Northern California Junior Golf Championship, Corpening said. Making sure people had access and opportunities was always part of what I saw as my purpose, my reason for being. Wherever I have been, I’ve always had this commitment to fairness and equity and access and opportunity, whether my role was explicit or implicit. The brothers enjoyed the game so much, they developed the bad habit of “playing hooky” from school and heading to the golf course, Corpening said. Their parents didn’t discover the boys’ misbehavior until it was time to check them out of school before a move to a new locale. Corpening said he moved frequently as “a military brat” and developed an appreciation for diversity and inclusivity. He lived abroad in Germany and Iran and all over the U.S. in California, Virginia, Massachusetts, Kansas, Texas, Georgia and Florida, where his parents are retired. He attended four high schools, including Tehran American School in Iran with students from all over the world. “If you grow up in the military, you’re used to being around different cultures and adapting to change. I never had a problem with that,” he said. But he may have been born with a sense of justice and the desire to fight for what’s right. As a boy, Corpening said he was always defending his older brother, whether against neighborhood bullies or their parents, when the two of them would get into trouble. At the University of Massachusetts Boston, Corpening joined the Black Student Union. He had his first experience with activism when he participated in a sit-in at the president’s office to protest the school’s lack of African-American faculty. “Through that whole process I learned how to be critical, I learned how to argue, how to think things through, how to develop a rational argument, how to fend off the counter to my argument. She taught me all that. She taught me activism in that sense,” he said. Corpening’s career in higher education began more than 30 years ago. He became the first person in his family to graduate from college, and then was hired as an Educational Opportunity Program (EOP) counselor at Morrisville State College in New York. 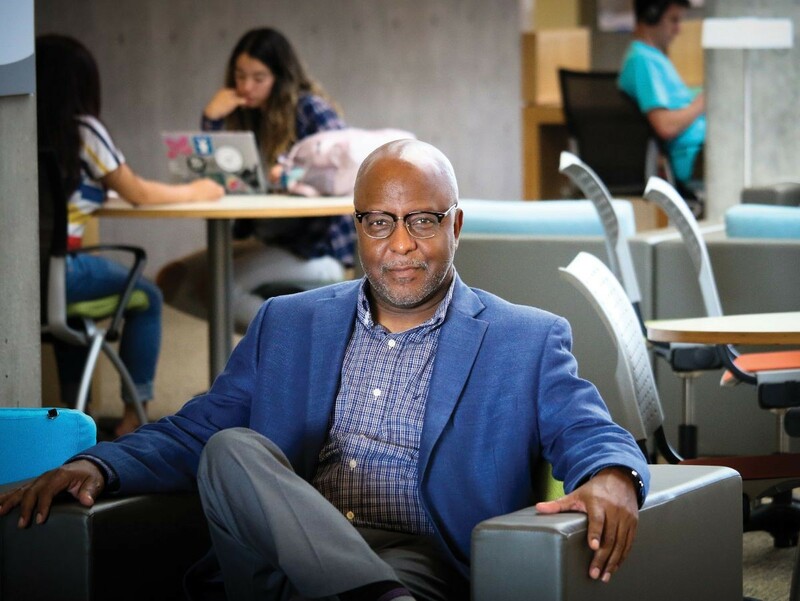 Before coming to CSUMB last summer, he had served as assistant provost for diversity & community partnerships at the University of Oklahoma Health Sciences Center since 2006. “Making sure people had access and opportunities was always part of what I saw as my purpose, my reason for being. Wherever I have been, I’ve always had this commitment to fairness and equity and access and opportunity, whether my role was explicit or implicit,” Corpening said. As head of the university’s Office of Inclusive Excellence, Corpening said his job is to help the university bring together diverse people and “leverage the power of the institution in ways that transform everyone,” regardless of their status, background and perspective. “Colleges and universities fully realize their transformative power when you bring people of diverse backgrounds to an environment, where they’re learning and sharing and growing and also teaching and developing. Because everybody’s a learner and everybody’s a teacher,” he said.